Info "Poke your foes! 1985: Super Mario Bros. / NES"
Super Mario Bros. is a microgame found in WarioWare: Touched! in the Retro Action stage. It is set in the NES game of the same name, Super Mario Bros.. There is another microgame in the game that is based on Super Mario Bros. under the same name: Super Mario Bros. The objective is to tap the on-screen enemies to defeat them. Enemies such as Koopa Troopas and Buzzy Beetles need to be tapped once to make them hide in their shells, and once more to make them slide across the ground, just like in the games. This move can be used to defeat other enemies like Spiny, which are the only enemies in the microgame that cannot be defeated by tapping them. This microgame has twice the time to complete than the others (8 seconds), as it takes time to remove the enemies from the screen. This microgame is won if all the enemies are removed from the screen. In the Grid, the player needs to score 25 points to pass this microgame. 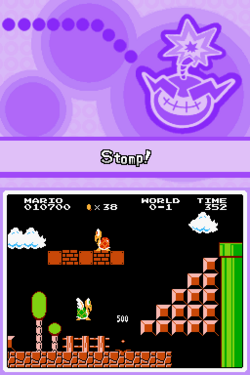 Mario also slides in from the left when the microgame is cleared. On level 1, he is small and riding on a cloud. Level 2 has Super Mario on a cloud. Level 3 has a giant Mario riding on a Bullet Bill. Level 1: The player must poke three foes. Level 2: The player must poke four foes. Level 3: The player must poke five or more foes. This page was last edited on April 12, 2018, at 18:39.